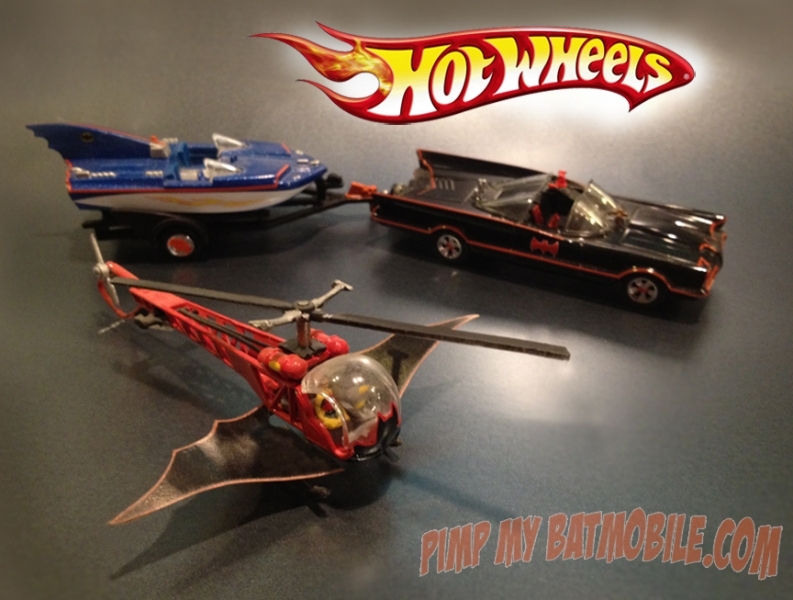 1966 Batcopter Showdown: Hot Wheels VS. PMB! 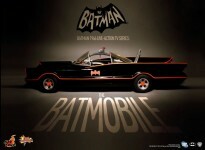 So the Hot Wheels 1966 TV Batcopter is out. And the final effort is less than stellar. First observation is that it’s NOT 1:50 scale. But we knew this was going to be the case. It’s closer to a 1:64 scale toy. I’ll try to do a real scale assessment later. I made a quick one in 1995 (which I never really finished) from a Zee Toys M*A*S*H Bell 47 diecast helicopter toy. I’m showing that one here next to the HW for some reference points. I want to do another custom Batcopter in this scale and there actually are a couple things about the Hot Wheels effort that I can borrow. But I’ll probably start with a more accurate Dinky or other small diecast Bell 47 rather than the Zee Toys one I used previoulsy, as it is one of the least accurate ones around. (Didn’t know that at the time) And before a bunch of folks call me on it – yes I know I left out the cockpit bat emblem and didn’t finish a few other details on my version. And the wings trim has faded over 17 years. On the other hand – mine has figures! Cockpit shape is wrong. It’s elongated and should be more spherical. Side of cockpit door/area should also be painted red, not silver. 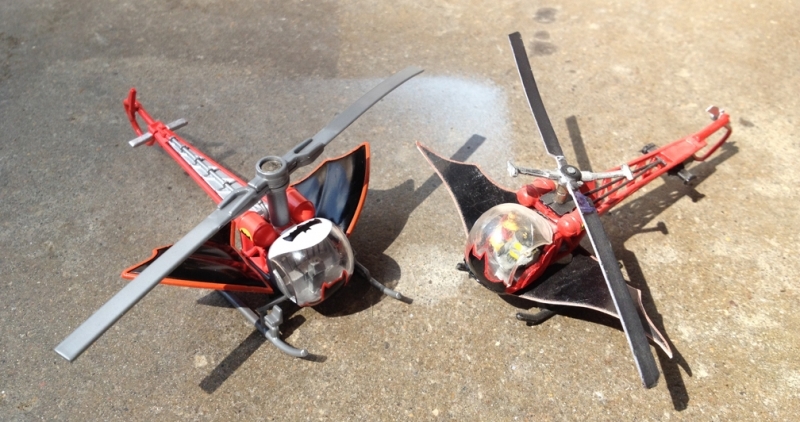 Fuel tanks are small, and more like the original Bell than the Batcopter’s. The fuel tanks on the real Batcopter had been replaced with larger tanks that don’t have the raised ribs or vertical straps that interrupt the bat emblem placement. The fuel tank bat-emblems are the wrong style, as is the bat and sizing of the bat-emblem on the top of the cockpit. They did not add the batwing design to the tail fin. Again, just bad design – the top of the detail on the lattice of the tail boom is closed in instead of being open like the sides. This just looks bad. Not to mention it should be red, not silver. The batwings, while being the wrong shape and thickness for the scale, do have the 3-D contoured wavy scallops that are tough to achieve in a custom piece. Though, be assured I’ll be attempting it on my next Batcopter conversion. 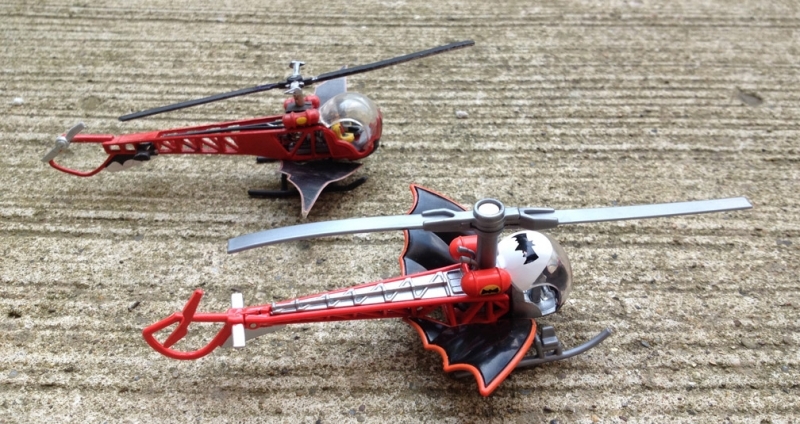 The shape and layout of the landing skids, while still toylike, are patterned after the modified Batcopter’s skids, rather than a stock Bell 47. The modified Batcopter exhaust pipes are better than on other Bell diecasts in this scale. This all just goes to emphasize that Hot Wheels is in the business of making “toys” not “scale models” which makes this whole line a big question mark – as it has all along. Collectors want accuracy. Kids want toys. Kids are not as familiar with this version of Batman as collectors so…how was the target audience determined for this line? It implies the answer: “Collectors, but we don’t care. They’ll buy them even if they hate them.” Which is sadly true. But we’d pay more and buy more if they were better. 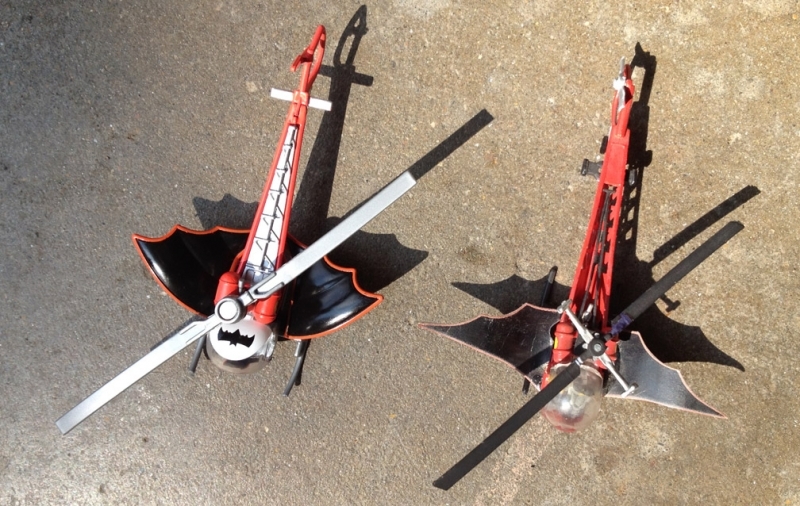 So – can the Hot Wheels Batcopter be modified, customized? Yeah, sure. But I wouldn’t bother starting with it. For this scale, I’d probably start with the Zee or Dinky versions out there and use the Hot Wheels one for some parts or just as a reference to tweak a couple of the small areas those models were deficient in. For any scale larger than 1:64(ish) – there are Corgis and other much more accurate base models to start with. A disappointing effort to be sure. Sometimes Hot Wheels makes a decent replica, sometimes they make crap. The various toys in their Star Trek diecast line were also a testament to the uneven quality of their products.